okay this is totally techy and boring to most but i'm really excited that i'm actually learning how to create animations. i would have never in a million years thought i would have a need for this much less think i would enjoy it. turns out my photography venture has led me to video which has led me to motion graphics. any pros out there will tell you what you are about to see it extremely elementary but i'm stoked. pretty sure this will not make it into the video i'm doing but am happy to have figured it out anyway. the video's about an actress who starred in the play "parade". this would lay over the video. i have not posted in a very long time. however, every once in a while something happens that i just have to talk about. in this case it's more like therapy. below is an email I received for a shoot. if you got this email and are familiar with bham, where would you go? even if you're not from birmingham, where would you go? "Fashion preview –– Thurs. 1 p.m. Coldwater Creek at the Summit (Will take pictures in front of waterfall off Cahaba River going East on Hwy 280) Three models involved. Want group shot and three separate shots." 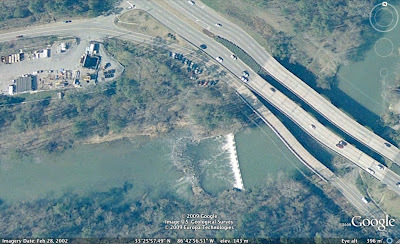 the cahaba river waterfalls off 280 right! well some of you may know where this is going. unfortunately 2 hours ago i did not. so i pull up to the parking lot which appears to be a nice little access to the river and waterfalls. i am 1 of 4 cars... check that, 1 of 5... another car just pulled up. what was interesting, i noticed, is that everyone was sitting in their car, oh yeah and everyone was a man! now excuse my naivety but i did figure since it is lunchtime these guys are just having their lunch by the park.... although no one was actually eating..... okay they've already finished their lunch and are killing the rest of their lunch break enjoying the falls. my job at this point is to find a good place to photograph 3 middle age women so i get out of my car and descend the hill to the waterfalls. i'm walking around the banks looking for the right angles and some solid ground. i turn around, satisfied with the location and notice that 4 of the 5 men who were sitting in their cars only 2 minutes ago are now coming down the hill towards me. okay, this is a growing up moment. my innocence is in the process of being destroyed and i'm hoping that's the worst that's going to happen to it. still my first thought was drugs... but then i just kept watching these guys. they were pacing, occasionally looking up at me, then looking down, pacing some more... all except this 1 guy. this guy looked like a suburban little league coach and he was coming right for me. we made eye contact, i nodded, trying to be polite! (in hindsight i'm thinking that must be the code) realizing nothing good can come of this location i hurry up the hill, quickly get in my car, look in my rear view and see that the little league coach is also already in his car. i step on it barely looking both ways only to catch the longest light on 280 where he enjoyed sitting behind me and getting all the info off my license plate. i then got into the slow lane, called the editor on the phone to gently explain that her email description was unbelievable wrong! (she meant the waterfalls at Grandview Parkway)... the cahaba doesn't even got over there!! thankfully my potential assailant must have concluded that based on my volvo wagon with a roof rack i must be more likely to be a lost outdoorsman than (as my mother so eloquently described it) "fresh meat". so he drove on by. i called a few people after that and apparently EVERYONE! knows what that place is except for me! i came in and told erin and she was like "oh yeah i saw that on the news". i don't watch the news! stokes comforted me by asking if i thought he was still following me? thanks. another thing that bothers me is why did only 4 out of 5 guys get our of their car? was i not good enough for you #5? doesn't seem like the place for standards. anyway i feel like i got punched in the stomach. thankfully i didn't really. seriously though look at where this is. that's 280! how much more public does it get? also notice how many cars are there. mine will never be again! isn't it sad that i felt the need to edit the google satellite image?